Today Facebook announced the "third pillar" in their strategy to be an even deeper part of your everyday life. The news feed and timeline features are the first two pillars and now the third is what they call graph search. The collection of information Facebook knows about you, your activities, and your connections is called your social graph. Facebook is constantly gathering this information at an astounding rate. "Almost a million new people every day. 240 billion photos. 1 billion people. 1 trillion connections," according to Facebook CEO Mark Zuckerberg. 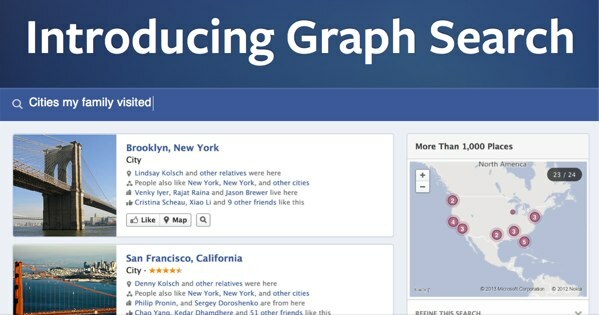 Graph search is the ability to quickly find people, photos, places, and interests that you are connected to on Facebook through the social graph the social network has built about you. Zuckerberg was clear that this is not like searching for a term on Google. Facebook is not accessing an index of everything on the web to answer your query, it's just looking at the massive social graph the social network has collected about you. That said, if it can't answer your question, it will fall back on Microsoft's Bing search engine to provide you with more typical results. What Kind of Searches Would I Want to Use This For? Facebook is relying on a natural language system. "Who are my friends that live in San Francisco?" or "Photos of my friends in 2009" are two examples given at today's press conference. But it can do more than just look up old friends. "Restaurants in Chicago" will help you find a place to eat. If you want a recommendation you can try "Restaurants in Chicago my friends have Liked." 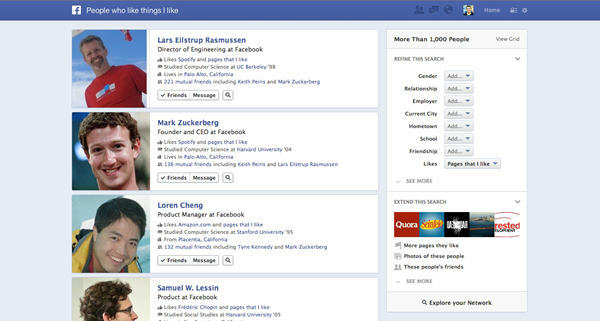 That kind of search, based on the interests of your Facebook friends is another big feature of the graph search. Another example given was searching for "My friends who live in Palo Alto who like Game of Thrones" if you want to get a viewing party together. Another way to get useful information from the graph search is to use it to make new connections. "People named Chris who are friends of Lars and went to Stanford." This will help you help you network with a new contact through a mutual friend. So it's more important than ever to make sure all of your information is accurate and up to date. This can even be extended into dating. Queries like "Friends of friends who are single and live in New York" would show you results of potential new love interests as well as the common friend that can introduce you. One of the most useful ways to work the graph search is to find photos. "Photos I've Liked" will show you all of those on one page. "Photos of my friends in national parks" can help you decide on your next trip. "Photos of my friends before 1990" may help you put together a reunion invite. For every search results page you get, there will be a Refine Search box that allows you tweak those results until you get what you're looking for. Facebook makes sure that you can only search for personal information or photos of others that has been shared with you previously. Same goes for others searching about you. If the content hasn't been explicitly shared, it won't show up in a graph search. Facebook plans to have a home screen prompt asking you to review your privacy settings when the graph search feature is rolled out to all users. In the meantime, they have a dedicated page explaining the privacy controls built in to graph search. When Is This Rolling Out? Right now graph search is in beta. Which means it's still in testing and only those who sign up for it can try it out. Facebook plans to introduce it "over the next few weeks and months." Do you think this is a feature you would use? decisions based on FB "likes"
every establishment/service/etc these days is offering some kind of “BONUS” if you “like them” on FB…it is tantamount to a bribe and therefore making any decisions based on the number of “likes” a place has would be WORTHLESS!!! Zuckerburg is crazy if he thinks users will endorse this new “pillar” It is intrusive and anti-social. Mark is a real head case, ignoring and disrespecting peoples boundaries and rights to privacy and the right to say NO, back-off! He is extremely manipulative and it is blatant in all his endeavors. Deeper social relationship, my eye! This is another way to invade individual privacy. So is entering this conversation via FB. Yet another opportunity for an app to post in my name. If you haven’t read Brave New World by Aldous Huxley, run, don’t walk, to your library. The book is 60 years old and so au current as to be frightening. I’d categorize it as adult science fiction. Then there’s Toffler’s Future Shock.